Nevada rancher Cliven Bundy’s three sons and “about 150” militiamen have occupied the Malheur National Wildlife Refuge HQ to protest the pending imprisonment of two Oregon ranchers accused of arson, arguing the federal government has no authority in local cases. “We’re going to be freeing these lands up, and getting ranchers back to ranching, getting the loggers back to logging, getting the miners back to mining where they could do it under the protection of the people and not be afraid of this tyranny that’s been set upon them,” Ammon Bundy, who appears to be the leader of the group, said in a Facebook video posted by Sarah Dee Spurlock on Saturday. Bundy appears to be standing at the scene of the takeover, surrounded by several men in military-style uniforms with rifles and hand-held radios. The rancher points out that Harney County used to be the richest in state, and is now the poorest. His radical proposal to solve the situation is to have armed “patriots” come and live in a de-facto self-rule zone independent of the federal authorities. Here it is. Please know these men will speak to people civilly. Do not go up there guns blazing. Stay safe and smart. The second speaker in the video, identified as Blane Cooper, equates the Bureau of Land Management (BLM) to bullies at school who used to beat kids up and who eventually had to be put in their place. “Until that line is drawn and say ‘we’ve had enough of this tyranny, you are going to leave us alone’ it will not change,” the military-clad man says. According to Cooper, they hope their occupation will spell the beginning of a US-wide movement. “It doesn’t have to stop here. This could be a hope that spreads through the whole country, the whole United States. Everybody’s looking for this hope because the government has beat us, and oppressed us, and took everything from us; they will not stop until we tell them 'no',” he claims. Splinter group of militia have occupied the headquarters building at Malheur National Wildlife Refuge. Group includes Ammon Bundy. There are three Bundy's in the building, according to @BundyRanch - Ammon, Ryan, and Mel. The militiamen told OregonLive there were about 150 of them, but a couple who delivered food to the refuge HQ estimated that there were just 15. Ammon Bundy, 40, told CNN by phone that the protesters want the federal government to restore the "people's constitutional rights." "This refuge - it has been destructive to the people of the county and to the people of the area," he said. "People need to be aware that we've become a system where government is actually claiming and using and defending people's rights, and they are doing that against the people." The Bundys and their armed supporters occupied the federal property after splitting from a peaceful Saturday morning protest in Burns, Oregon. Some 300 people marched through the town to protest against the prosecution of two Harney County ranchers, Dwight Hammond Jr. and Steven Hammond, who are scheduled to report to prison on Monday. Both ranchers were convicted on charges of setting fire to federal land. The case has attracted interest from local militia and intensified debate around the federal government’s authority. “Dwight Lincoln Hammond, Jr., 73, and his son, Steven Dwight Hammond, 46, both residents of Diamond, Oregon in Harney County, were sentenced to five years in prison by Chief US District Judge Ann Aiken for arsons they committed on federal lands,” the US Attorney Office said. About 200protesters have gathered at the fairground in Burns. They say their movement needs to stay defensive, peaceful. The occupation resembles the Bundy Ranch stand-off of 2014, when the Bureau of Land Management (BLM) attempted to enforce grazing laws. 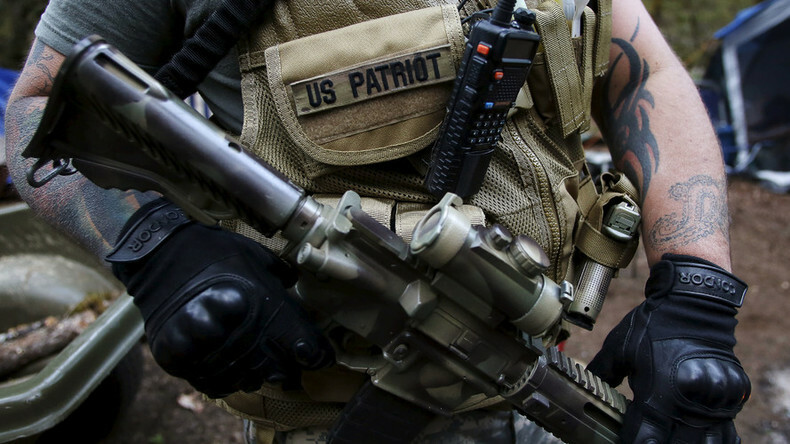 Bundy got the help of armed militia and triggered a stand-off with federal authorities. The dispute began in 1998 when the BLM designated 186,909 acres of the Gold Butte area, where the ranch is located, as “critical” for the survival of the desert tortoise population. Bundy had lost his grazing permit in 1993, despite his family’s long-time presence on the land. According to the BLM, Bundy owes around $1 million in fees, while the family contends the sum is more like $300,000. The Pendleton, Oregon jury found the Hammonds guilty of the arsons in June 2012. Both were charged with igniting a series of fires on lands managed by the BLM. Hammond Ranches has about 12,000 acres in the Diamond-Frenchglen area. Their livelihood is running cattle during the winter. Two years ago, the ranch used 26,420 acres of land belonging to the BLM for summer grazing. Supporters of the Hammonds believe they were treated unconstitutionally because the two were convicted of arson under a provision of an expansive federal law punishing terrorism. They both served their prison terms for 2001 and 2006 fires, but were then told by appellate judges they had to go back to prison to serve more. However, Hammonds said they did not welcome the Bundy group's help, CBS News reported. "Neither Ammon Bundy nor anyone within his group/organization speak for the Hammond Family," the Hammonds' lawyer W. Alan Schroeder wrote to Sheriff David Ward. Ranchers use fire in eastern Oregon to burn invasive species. However, it is a dangerous practice, as several wildfires in the area have got out of hand, scorching hundreds of thousands of acres. The controversial case demonstrates a problem with a 1996 law, which was introduced to punish domestic terrorists, according to Barry Bushue, the longtime president of the Oregon Farm Bureau.